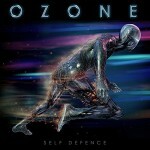 Share the post "Album review: OZONE – Self Defence"
This album is a little bit special as it sees two of the UK’s premier rock vocalists team up, namely FM’s Steve Overland and Chris Ousey, currently fronting Snakecharmer and Heartland, plus he fronted Virgina Wolf back in the 80′s. As if this wasn’t enough we have the legendary Mike Slamer (Slamer/City Boy/Seventh Key) at the helm adding his distinctive sound to the proceedings. In fact fellow Seventh Key member Billy Greer is present on backing vocals, as is his fellow Kansas band mate and new boy Ronnie Platt (he replaced Steve Walsh in Kansas last year). Finally we have Tommy Denander helping out on guitar/bass/keys and songwriting. On paper an impressive line-up and happily they deliver in the music and then some! The album stand out for me is the superb ‘Shadow On The Sun’, a song that features that classic Slamer sound in the guitar riffs and keyboard runs on the chorus, and one of the catchiest choruses you will hear this year or any year for that matter. It is great to hear Overland and Ousey trading lines on the songs, be it the slower ‘Save My Soul’ or the classy upbeat melodic rock of ‘Tiger By The Tail’. Neither have lost any of their vocal power down the years and in fact you could say both are still in their singing prime. A tinge of sadness though as it features Christian Wolff (Overland/Mecca) guesting on ‘Evolve’, who sadly passed away this year. This entry was posted in ALBUM REVIEWS, ALBUM REVIEWS (Mobile), All Posts and tagged album, Billy Greer, Chris Ousey, City Boy, FM, Heartland, Kansas, melodic rock, Mike Slamer, Ozone, review, Self Defence, Seventh Key, Steve Overland, Tommy Denander. Bookmark the permalink.